The first time we took our three-year-old son skiing, we made a rookie mistake. We didn’t dress him warmly enough. Chilled to the bone, he hated skiing. Not even hot chocolate worked. We went home discouraged and it was a full year before he’d try skiing again. And on our second attempt, we dressed him well, kept him cozy and made sure the experience was fun. From that day on, it was full-speed ahead. He’s never looked back and we’re just trying to keep up. There’s a lot more to teaching your kids to ski than ensuring they have proper gear. But by ensuring your child has the right clothing and equipment, you give yourself a head start. No matter how old your child, make sure he or she is wearing a proper ski coat and pants. As we found out, this is really important. Also, don’t skimp on the base- and midlayers. There are a lot of great baselayers for kids. Some of our favorites comes from StripesGear.com. One of the best ways to get quality gear (and have it professionally sized and fit to your child) is with season-long rentals from your ski shop or resort. If you missed the window for these, try to pick up your child’s rentals the night before your ski day. Not only will everyone be more relaxed (parents, child and ski techs), but you won’t have to worry about getting overheated in the rental shop or missing the start of a lesson. Also, spend $10 and get an Edgie-Wedgie, or similar bungee device that clamps onto ski tips to keep them from crossing or spreading too far apart. The Hookease is another tool to help make learning to ski easier. Here we’ve got Olympian Picabo Street using Hookease with a friend. Photo courtesy Launch Pad. Kids are motivated by fun and they learn through play. Most kids don’t care how much vert they score on any given day, or how perfect their turns look as they gaze back up the hill. Those pursuits are for parents. This means the few days on snow with your child should be dedicated to play and happily spending time together. Photographer: Keoki Flagg. Photo courtesy Squaw Valley. To get started, leave your skis and boots at home. You won’t need them. Find a nearly flat slope or bowl upon which to practice basic movement. Make up silly games as you pull your child around with your ski poles. Teach him or her how to shuffle the skis and start sliding. Laugh a lot and make silly noises. Take a break for hot chocolate before your child is tired or cold. Skiing is tiring. Sometimes what’s really needed is a good nap! Once your child is comfortable sliding and enjoying time on the snow, its time to sign him or her up for a lesson. Start with group lessons. Not only are they more economical, but most kids really enjoy learning and playing with other kids. To get your child ready for ski and ride school, try to visit the children’s center a day or two before the first lesson. If you can’t get to the resort, show your child the magic carpet and ski school on a map or website. Point out other children skiing with instructors, or watch some videos of kids in group lessons. Each of these things will help familiarize your child with the idea of lessons and build a sense of comfort. Ski school in action at Ski Granby Ranch. On the day of the lesson, make sure your child knows where you will be and what time you’ll be back for pick up. If you’re anxious, keep your concerns to yourself. Don’t give your child any reason to worry. Try to arrive early so that no one has to rush. Introduce yourself and your child to the instructor. Visit the ski school, or in this case the Heavenly Bear Cave, before the first lesson. Sometimes kids are nervous or have separation anxiety. Most instructors know exactly what to do in these situations. They’ve seen it all before. Work with the instructor to create a game plan. Most importantly, don’t “spy” on the lesson. Instead, click into your bindings, hop on the lift, and enjoy some adult skiing. And, oh yes, be on time for pickup. Check in with the instructor after the lesson and get a report. Find out what was taught, where he or she skied and ask the instructor how you can reinforce what your child just learned. Get recommendations for appropriate runs and trails. Find out what level lesson to sign up for the next time. Most importantly, get a handle on the vocabulary and terminology used by the ski school. If it’s a pizza/french fry teaching method, adopt those terms. If the ski and ride school is all about direct-to-parallel, ask questions so that you can mimic this method. As I know first-hand, it can be hard for enthusiastic parents to keep their expectations in check. We love our children and we love skiing. Of course, we can’t wait to ski as a family. Skiing as a family will come easier and faster if you don’t push your kids too hard or too fast. Make time to laugh and play together. Be patient and focus on fun. Create positive experiences that instill a love of skiing in your children. 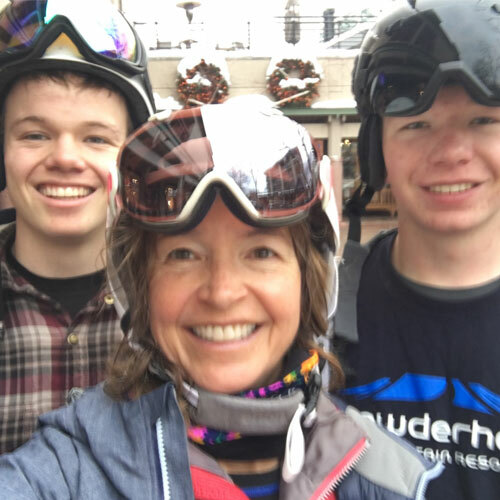 Our sons don’t look like this anymore, but we still love skiing together. Soon enough, you and your kids will be skiing the same runs. Then one day, they’ll pass you, ripping perfect turns down a steep line. Now it’s your turn to keep up. January is Learn to Ski and Snowboard Month, with great deals on children’s lessons at resorts throughout the United States. For more information, find your resort on the LSSM webpage. Portions of this post originally published at the Christy Sports Ridge Report on December 16, 2015. More Than Gadgets: Learn-to-Ski Aids for Young Children, December 3, 2012. Start Right: Eight Learn to Ski and Snowboard Tips for Your Child (And You! ), January 8, 2014. What You Need to Know to Start Your Child Skiing or Snowboarding, January 11, 2011. How Cold Is Too Cold For Skiing?